The time is coming — if it hasn’t arrived already — when Sloane Stephens will be forced to drop the swirly heart she affixes to her name when she signs autographs. The number of adoring fans clamoring for her signature simply will be too great, demanding expediency over art. But there she was Friday morning on the fissured courts of Prince George’s Community College, where she had just held a clinic with roughly 100 youngsters of varying ability, wielding a Sharpie as purposefully as she wields her racket, looping the final “e” of “Sloane” into a heart on every tennis ball she autographed. At 20, Stephens is the fastest rising star in American tennis. This week, she brings her career-high No. 15 ranking and luminous personality to Washington’s Citi Open, her first tournament since reaching Wimbledon’s quarterfinals earlier this month. With a blistering forehand and exceptional on-court quickness, Stephens boasts the gene pool of a can’t-miss pro athlete, daughter of a former NFL running back and an all-American college swimmer. And her arrival in the top ranks of the sport has been embraced in a country that has long lamented its lack of budding tennis champions. But Stephens is neither a cookie-cutter replica of her parents nor the next Serena Williams, as often portrayed. And she’s far from a finished product, still learning to close matches against seasoned competitors and to calibrate her candor in a way that’s true to herself without rankling others. 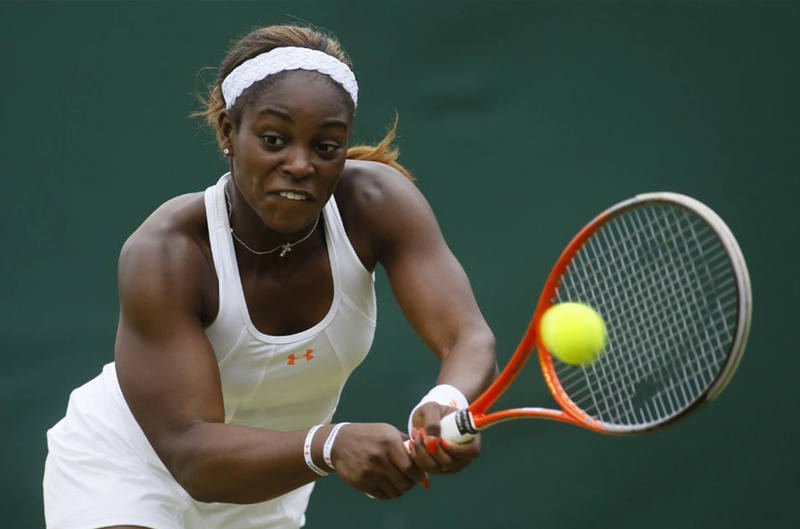 Stephens is among a handful of promising young Americans that includes 18-year-old Madison Keys, 21-year-old Christina McHale and 17-year-old Taylor Townsend. All are entered in the Citi Open’s women’s tournament. Stephens, however, has separated from the pack this season, particularly on the big stages, reaching the fourth round or better at all three majors to date, each on a different surface. She stunned Williams to reach the Australian Open semifinals. After making the fourth-round on the French Open’s red clay, she went one round better at Wimbledon, falling to eventual champion Marion Bartoli. With Stephens serving a must-hold game at 5-6 in the opening set, the proceedings were halted more than two hours by rain. When play resumed, Stephens’s serve and focus were gone. The Citi Open, which gets underway Monday at William H.G. FitzGerald Tennis Center in Rock Creek Park, marks the start of Stephens’s preparation for the U.S. Open. It was at the 2009 U.S. Open, where she was competing as a junior, that Stephens received the news that her father, John Stephens, who played five seasons for the New England Patriots, had been killed in a car crash. She had only gotten to know him as a young teen; her parents divorced years earlier. After consulting with her mother, Sybil Smith, a psychologist and former Boston University swimmer, Stephens left New York to attend his funeral in Louisiana, then returned to the tournament. The fatal accident came just two years after Stephens lost her stepfather to cancer. Stephens didn’t start playing tennis until age 9 but showed such early promise that she switched to home-schooling at 12. As she climbed the junior rankings, agents and corporate sponsors vied for her rights. Stephens delights in the growth of her Twitter followers (@sloanetweets), approaching 60,000. But she made more news than she intended in an interview with ESPN the Magazine in which she characterized Williams as cold and unfeeling — comments she later said were incorrectly portrayed. It’s a topic she no longer wishes to discuss. The spotlight of Grand Slam stages is a world away from Prince George’s Community College, where the faded green asphalt of the eight courts is riddled with cracks and ankle-high weeds. Stephens chose the complex for a major refurbishment funded by American Express and the U.S. Tennis Association after taking an interest in the county’s Tennis and Education Foundation. Askew, the coach she had at 13, had brought several students to watch her compete against the Washington Kastles and at the U.S. Open. But last year, when the group couldn’t raise the funds for the trip to New York, Stephens underwrote their $3,000 expenses. On Friday she stood on their home turf, where a long line of children, scaled-down rackets in hand, waited for a chance to hit with their favorite player. And she tapped an oversized orange-and-yellow ball so it landed perfectly waist-high. Up next was a boy named Anthony, whose prowess caught Stephens off guard. And so it went, until each child had taken a turn, shared a hug and gotten an autograph.